Hezbollah sent a message Wednesday night that it was not seeking to increase tensions with Israel. Despite a message from Hezbollah Wednesday night that it was not seeking to increase tensions with Israel, security officials in Israel said that Israel would respond to the Hezbollah attack on an IDF patrol earlier “at a time and place that suits the IDF,” the spokesperson said. Israel would not let the attack that killed two IDF soldiers earlier Wednesday to go unanswered, the official said. Two IDF soldiers were killed earlier Wednesday when Lebanese terror group fired antitank missiles at two IDF vehicles in the Har Dov area (Shebaa Farms) in a Hezbollah ambush. The two soldiers killed were identified as Major Yochai Kalangel and Sgt. Dor Nini, the IDF Spokesperson's Office said. Six casualties in light to moderate condition were taken to Ziv Hospital in Tzfat. Additional casualties were evacuated to Rambam Hospital. 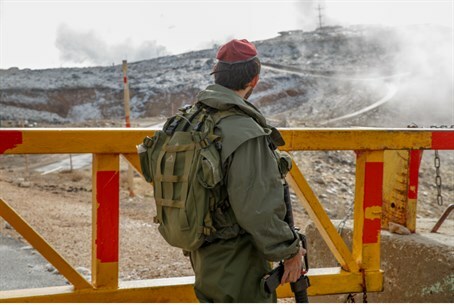 The IDF vigorously denied Hezbollah claims that an IDF soldier had been kidnapped, and a Lebanese report later confirmed that Hezbollah had failed to capture an Israeli soldier. Hezbollah later delivered a message through UNIFIL, the UN special patrol force in south Lebanon, saying that it was not seeking to increase tensions with Israel at this time. As far as the terror group is concerned, the message said, Wednesday's actions would satisfy Hezbollah's demands for revenge against Israel for last week's IDF attack on a convoy on the Syrian side of the Golan border. In the attack, Israel eliminated Jihad Mughniyeh, said to be Hezbollah's “commander of the Golan Heights area,” along with a crew of Hezbollah terrorists, and Iranian general Abu Ali Tabtabai. Prime Minister Binyamin Netanyahu said Wednesday that the parties responsible for the attack on Har Dov earlier in the day that claimed the lives of two IDF soldiers would “pay the full price for their actions.” Netanyahu made the comments Wednesday evening before a meeting of top army and government officials discussing the attack by Hezbollah terrorists earlier Wednesday. “Those who committed these acts will pay the full price for their actions,” Netanyahu said. “For a long time Iran has been using Hezbollah to establish a terror front against us on the Golan. We are aggressively acting to prevent this. The government of Lebanon and the regime of Bashar al-Assad in Syria are responsible for attacks on Israel that emerge from their territory,” he said.